When we were living in Bozeman, we were friends with a lovely family that used lots of wooden bowls and utensils. He could tell you exactly where he was when he carved a certain spoon. When you ate from the bowls and used the spoons…you just felt so connected and earthy. We put away all of our metal plates and we now each have a wooden bowl to eat from and bamboo wooden utensils that I had previously purchased from To-Go Ware. We eat everything and anything in these wooden bowls. I am in love. 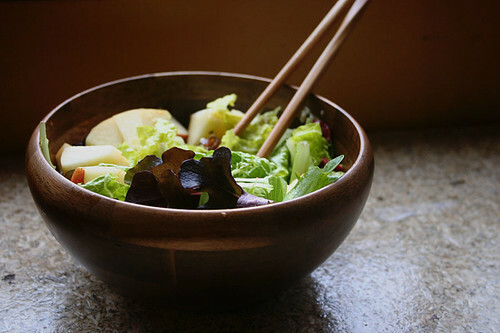 I have been using the bamboo chopsticks to eat my salad at night and it’s been such a great way to slow down the pace of my meals. I truly savor every leaf and morsel that I am able to grab with these 2 sticks. As I slow down my pace of eating, I am able to relax and be more conscious of what I’m eating and how much I’m eating. Growing up, I was notorious for being done with my food before everyone else, so this is a big change for me. Eating slowly aids in better digestion…taking time to chew eat bite slowly before moving onto the next is the first step of the digestive bliss (tip: your food should be “mush” before you swallow it!). I am slowly learning my body’s true signals for fullness, and by eating slowly, I am able to stop eating before I am stuffed. It also enables me to be more thankful for my food as I have more time to consider how blessed I am to have food so readily available to me. I want everything in my life to be artful and beautiful…and the kitchen is no exception. My goal is to have only wooden or handmade items in my cupboard…things I consider to be beautiful. I currently have a nice collection of pottery cups and small bowls and every time I look at them I smile. They have been gathered from different travels and different artists and I feel their love in them whenever I use them. I challenge you all to have at least one beautiful wooden bowl and/or piece of pottery in your kitchen and to try one meal this week with chopsticks. Eat mindfully… you’ll love it! We love our wooden bowls! We have plenty and started using them a couple of years ago. Elisabeth has her own set of wooden utensils too 🙂 For some reason I even love washing wooden bowls. Is that weird?! I find it very meditative. Elisabeth also had a bamboo bowl that she dropped and broke. Do you ever see T.J. Maxx’s out there? The ones here had a whole section of bamboo kitchen items. Also, Etsy.com. I search for everything I need there first. Yes, it’s more expensive, but I love knowing exactly where my money is going and knowing someone put their love and hard work into whatever I purchase. Oh, those are so pretty! We do have a gorgeous wooden salad bowl and utensils that we received as a wedding gift. I love to rub the bowl with a cut garlic clove and oil before I add the veg! Eating with chopsticks is fun, but we also just eat with our hands a lot, scooping up food with rice India-style as my husband grew up doing that. My MIL is such a pro that she never gets food above her first knuckle! Bozeman, huh? A friend of mine is living there right now… she’s actually blogging her year of consumeless-08. My grandparents used to have wooden bowls, I loved them. I, too, have started searching for wooden treasures for my kitchen. I just picked up a beautiful organically shaped wooden cutting board when I traveled to Australia – it was handcrafted by a local. I love it! The other students (it was a college study abroad trip) though I was crazy for bringing back wooden cutting boards and spoons as my souvenirs – but I cherish them! After I purchased them, I started looking around on Etsy for more wooden pieces, and there’s a lot out there! I just “discovered” your blog late last week. I love how descriptive you are and love all this new (to me!) information. I have been making my family green smoothies every morning and we all love them! Our favorite so far is spinach, orange, banana. And I am completely in love with the date/apple combination! I can’t believe how delicious it is! I have a sweet tooth afer dinner and it makes the perfect dessert. So thank you for your wise words, you are helping my family eat healthier! I will be a regular follower of your blog. And I like the idea of using wooden kitchen items and having all hand made pottery etc. It sounds so beautiful and eclectic. Bluebirdbaby and Megan…thanks for the tip on Etsy. I would have never even thought to look there! The links that Megan gave are AMAZING! I love them all. Wow. I love the Bambu brand bowls but I would rather support an individual artist any day! Bree…can you post her blog so I could check it out? I love meeting other Bozeman dwellers 🙂 You should see if you could get the bowls … how neat to be able to pass them down through your family! anniegirl…so glad your family is enjoying the smoothies…aren’t they GREAT? I am eating some dates and apples as I type this! I have a huge set of bowls my best friends parents bought us in the Philipines- I absolutely love them! I have 8 bowls and a huge bowls they all sit in, plus the serving spoons. My husband loves chopsticks, but I have a hard time using them, but probably because they dont allow me to shovel in my food. I have a beautiful wooden salad bowl (huge) and wooden cutting board, both from my parents. The sad part – they are so gorgeous that I hate to use them. Sheesh .. what a way to honor a gift. I shall pull them out this week. I loved this tip, especially as I pare down my dishware to the beautiful and minimum .. I have seen wooden bowls in op shops (thrift shops) here, but have always hesitated to buy them, wondering about hygiene. How do you wash your wooden things? Do they deteriorate with wash? Does food stain them?? Nikki…the only time I found some at a thrift store, they smelled so bad that I couldn’t even carry them around the store with me!! Ick. Wood does tend to hold smells and stuff so much more, so I’d be a little more picky. I would sand them down, soak them in vinegar/soap and the re-mineral oil them. I hand wash everything…we don’t have a dishwasher in the RV. Food doesn’t stain mine…but then again, mine are very dark. Most have a nice coating of mineral oil to keep them “fresh”. I kind of like them to have a “worn” look though.